When compared to traditional network monitoring tools, ExtraHop delivers significantly more functionality for a fraction of the cost, saving approximately 2.5x. Let's be honest—the IT vendor market is full of hype. "No other solution is capable of (insert awesome stat here)!" "Our platform is the only one that delivers (fill in the blank)!" Customers are confronted with so many of these hyperbolic claims that they have practically lost all meaning. At ExtraHop, we have always believed in radical transparency — in other words, we should tell you the truth about our product's performance, and if our claims seem too good to be true, we should prove them. In that spirit, we decided to put our platform through some aggressive validation tests. We tapped Enterprise Strategy Group's (ESG) Lab Validation Testing process to prove that, yes, our platform is as awesome as we say it is. Of equal importance, however, was our hope to raise the bar for product integrity among IT vendors and to give customers the accurate information they deserve. Below is a breakdown of ESG's findings about the ExtraHop platform's performance and capabilities. ESG first set out to test how quickly ExtraHop's Discover appliance could be deployed and, more importantly, how quickly it could begin collecting and analyzing network data. In short, ESG had it installed "within minutes" where it began pulling data in real-time. "Within a day of monitoring traffic, an anomaly was detected. Interactive dashboards enabled ESG Lab to point and click on any data point desired, which eventually led to tracking down the underlying culprit." Deploying an ExtraHop only takes a few minutes. "Organizations are looking for the least number of tools that will provide a global as well as granular view of more than just a conversation taking place. They want a platform that will uncover the actual content of the conversation." After deploying ExtraHop, ESG explored the platform's flexibility to fit into unique business environments. 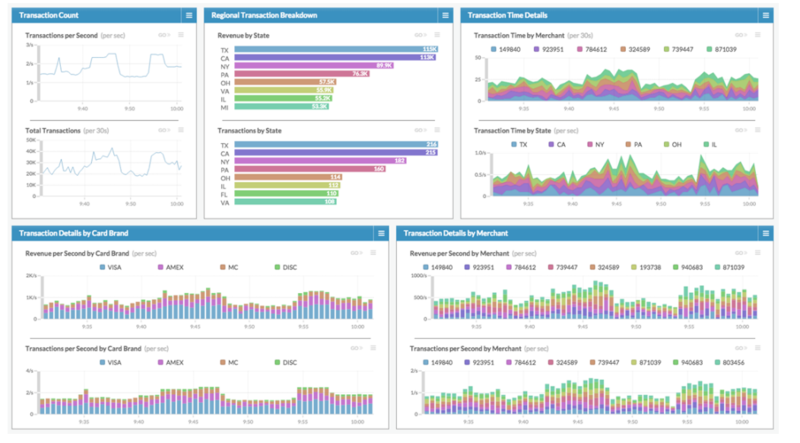 Stacking ExtraHop's capabilities up against traditional network monitoring tools, ESG focused specifically on a payment processing use case and uncovered deep levels of insight into user, network, infrastructure and application communications. Better yet, it was all gleaned from a single tool. Furthermore, ESG found that the transition from analyzing wire data on the Discover appliance to the Explore appliance was seamless, leveraging the same interface "to query specific transaction details related to the application." An ExtraHop dashboard featuring correlated data from L2-L7. Among ExtraHop's primary differentiators is its ability to achieve real-time monitoring of up to 40 Gbps of traffic with a single physical appliance. ESG Lab validated that ExtraHop truly delivers "high levels of sustainable performance." As ESG learned, because ExtraHop pre-processes and analyzes all traffic before any data is written to disk, "the platform is not bottlenecked by disk I/O." In terms of price vs. performance, ESG validated that the platform offers an average savings of "more than 2.5x compared to traditional tools." "ExtraHop customers get 40 Gbps of real-time stream analysis and perhaps the richest source of empirical insight, wire data..."
ESG's tests showed that ExtraHop provides by far the best value per Gbps of analytics. While those findings could be considered boast-worthy, for us it's more about proving our value to our customers. As the IT landscape continues to shift, having next-generation monitoring capabilities is no longer an option. At ExtraHop, we believe buyers deserve to be able to make fair comparisons when searching for those tools. While "low cost," "extremely fast," and "highly flexible" might seem redundant and diluted in today's marketplace, ESG's validation testing proves we're not exaggerating. Download the full report today to learn more about ESG's methodologies and findings and discover the true value and control ExtraHop is bringing to network monitoring.